Our October issue of Intercom is out now! This issue we look ahead to World Mission Sunday, 22 October. On our cover this month we feature the World Missions Ireland poster, with pictures of Missionaries from around the world. 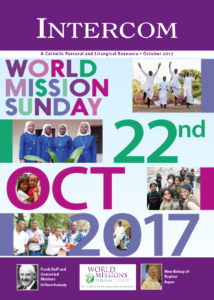 In our October issue, we look at the origins and meanings of Mission Sunday, as well as resources from Irish Missionaries. Also in the new issue, we offer resources for a Harvest Thanksgiving, Canon Edmund Cullinan reflects on the laity as a source of inspiration, we listen to Dr Finola Kennedy on Frank Duff and the Regina Coeli Hostel, and Maeve Mahon writes on Faith Formation in our Primary Schools. All this and more along with all our usual prayers, reflections and resources for the month of October. Click here to see our full September contents page. Our September resources are available here. October resources will be available soon.